Organizations are realizing how their IT performs will directly affect how well their business performs. Solid state storage made from NAND flash memory chips has evolved in terms of cost, performance, and reliability to the point where many organizations are seriously considering its use to replace inefficient, unacceptably slow mechanical spinning disk systems. This accelerating trend has led enterprises to ask some natural questions: When should flash be used? 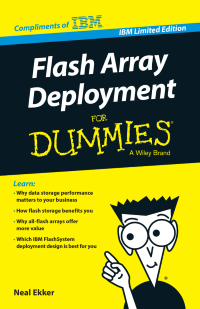 Which flash solution is best for each particular use case? And how can I make it a successful, cost‐effective part of my data center?